"Six-feet of Sunshine," Kerri Walsh is on her way to becoming the best female beach volleyball player of all time after only playing professionally for seven years. Walsh is a two-time AVP MVP (2003, 2004) and part of the Tour's Team of the Year for the past five seasons. She has also been named AVP Best Offensive Player in 2003. For the third straight season, she was chosen as the FIVB's Best Hitter, Best Blocker and Sportsperson in addition to collecting the 2007 Best Offensive and Most Outstanding Player awards. 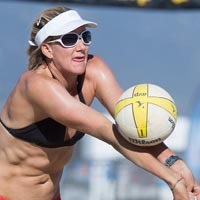 Along with partner Misty May-Treanor, Walsh had one of the longest and most impressive winning streaks in professional sports after winning 89 straight matches on the AVP Tour as well as the international circuit between 2003 and 2004. In 2007 her 20 wins (domestic and international combined) tied her with May-Treanor for the most wins in a single season. Walsh captured the public's imagination in 2004 by bringing home a Gold Medal from the Athens Summer Games, and soon afterwards started a stretch of 50 consecutive match victories. Walsh and May-Treanor have also captured the SWATCH-FIVB World Championships in 2003 (Rio de Janeiro), 2005 (Berlin) and 2007 (Gstaad). In 2006, Walsh became the fourth American woman to surpass $1 million in career earnings, accomplishing the feat in Chicago. She and May-Treanor established AVP team records for wins (13) and prize money ($408,800), while Walsh set the standard for season wins by an individual (14) and prize money ($242,650). She has led the AVP in both blocks and hitting percentage in 2005, 2006 and 2007. She has been the top-ranked player each season she has played domestically. In February 2007 Walsh won the individual exhibition event in Albany, N.Y.
Walsh comes to the beach with impeccable indoor credentials. She graduated from Stanford University with a BA in American Studies. While there, she became only the second player in NCAA history to receive First-Team All-American honors all four seasons (1996-1999). She was also the first player in PAC-10 history to record 1,500 kills (1,553), 1,200 digs (1,285) and 500 blocks (502). Walsh is considered to be one of the best all-around players in collegiate history. Born to Margie and Tim Walsh on August 15, 1978, Kerri grew up playing sports with her older brother Marte and her younger sisters Kelli and KC. She comes from an athletic background as her father played minor league baseball for the Oakland A's and her mother was named two-time MVP in volleyball at Santa Clara. Marte played basketball at Cal Poly SLO, while Kelli played volleyball at Santa Clara and KC is a setter at Oregon State. Before her successful transition to the beach, Walsh had a thriving indoor career where she was a member of the United States National Team for two seasons (1999-2000) and was a right side hitter on the 2000 Olympic Team, helping the team play in the medal round and finish fourth in Sydney. Walsh currently resides in Hermosa Beach, California with her husband Casey Jennings, one of the top men's volleyball players on the Tour. The two were married December 4, 2005. <>They have two boys, Joey, born in May 2009, and Sundance, born in May 2010, and one daughter, Scout, born in April 2013. Both players won in Seaside Heights in 2006, making them the second married couple to win on the same weekend, joining Mike and Patty Dodd, who accomplished the feat four times. Walsh and Jennings again both won in San Francisco in 2007 as well as in Manhattan Beach in 2013.